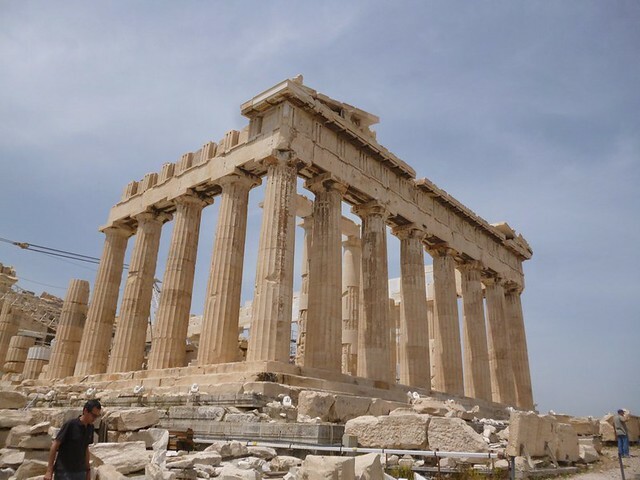 Since I am staying 7 nights in Athens, I have 6-full days for sightseeing in the city. I had planned to slow down my pace and visit only one museum/ site a day. Today’s plan was to see the National Archaeological Museum which is near by hotel and roam around the city in the afternoon. When I went out a little before 8:30am, the sky was grey and cloudy and the temperature was cool. It felt like my kind of day. Using directions by Google Maps, I took bus B12. The signs for buses here in Athens is all Greek so I don’t think the government recommends tourists to take the bus. Before the museum, there was a little cafe and the price of its bread was very reasonable. I had a pastry with cheese filling and a cappuccino. While eating, a little tanned girl with messy hair came into the cafe to ask for money. It was rather awkward for me and I focused on my bread. I didn’t want to encourage begging and thought that it was better than her going out and pickpocket. Actually, begging is not any better than stealing. The museum was large but not overly gigantic like the Vatican Museum. My Rick Steve’s audio guide for the museum worked perfectly, telling me highlights of the museum and the history behind them. In fact, I had been enjoying Rick Steve’s audio tours for all the places I’ve been. I highly recommend you to download them if you are heading to Europe. He has mobile apps as well as podcasts and they area all free. 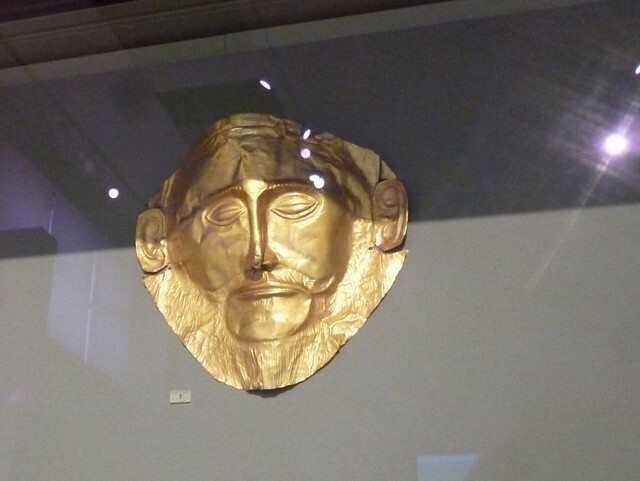 While the museum had lots of great Greecian works (like the gold mask above), my favorite section was the little corridor with statues of Athena. 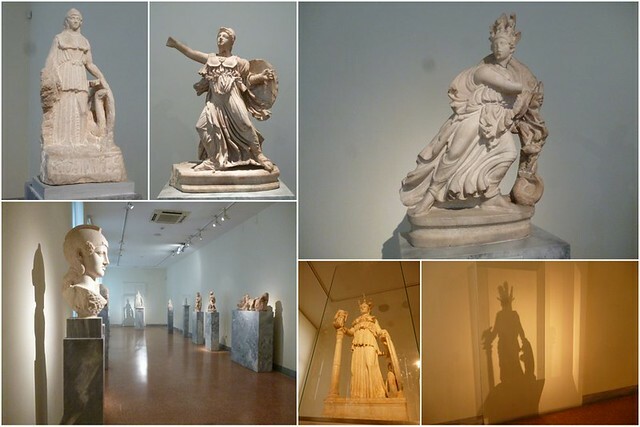 At the end of the corridor was a small statues of Athena, her helmet decorated with winged beings, her Peter Pan collar decorated with snakes (!) and her shield also decorated with a snake. This was a miniature copy of the gigantic Athena statues that stood in the Parthenon in the ancient time (a replica in Nashville shows the size of Athena). After the museum, I was thinking of where next to go. The sky was still grey and cloudy so I thought it would be perfect to go to the Acropolis and enjoy a not sweaty climb. Off I went to the metro, buying a frappe to drink along the way. This time, the frappe had a less sour endnote. I’m getting to like this more and more. It was about 12 noon when I reached. Based on my experience at the Vatican Museum, this was the best time to visit any famous sites as the tour groups have headed for lunch. I got my tickets at the Theater of Dionysus so there wasn’t a queue. Even with the ticket, I had to exchange for an electronic ticket at the main entrance so it kind of annoyed me. Rick Steve’s Acropolis audio tour kept me company the whole way. This is way cheaper than hiring a tour guide and less taxing! The path to the Parthenon wasn’t a smooth walkway and I was thankful that my sandals didn’t sprain my feet. Oh, I forgot to mention, the sun decided to come ot and play when I bought the ticket. The sky was cloudy but the ray of the sun pierced through and made it a little too warm. It got so hot that I had to hide in the shade, thinking if I should wait for sunset and leave at 8pm (it was 2pm then). I didn’t leave that late but I did hang around in the shade, writing postcards. Postage in Greece is cheaper than in Italy. 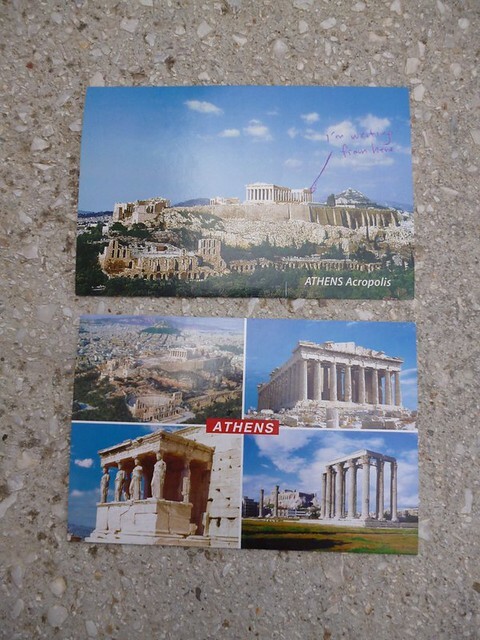 I had to pay 2 euro to mail a postcard from the Vatican City but here in Greece, it was only 78 cents each. Oh, I also started eating a chocolate pastry I bought. 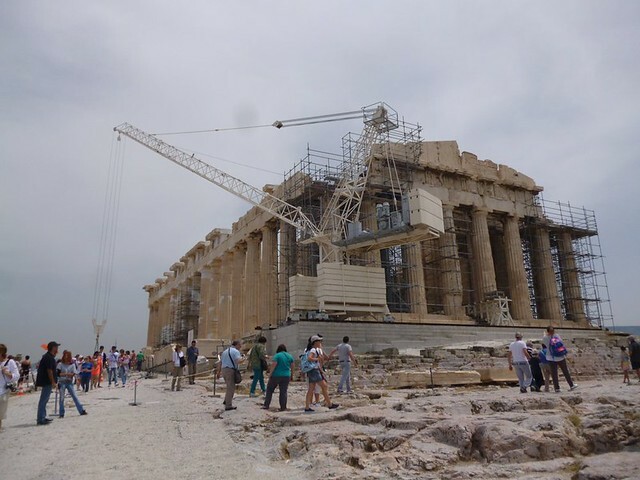 I was told by someone working at the Acropolis that only water is allowed. Oops. After my long wait, I finally finished my audio tour and descended from the holy hill. My phone’s battery was dangerously low then so I decided to head back to the hotel. 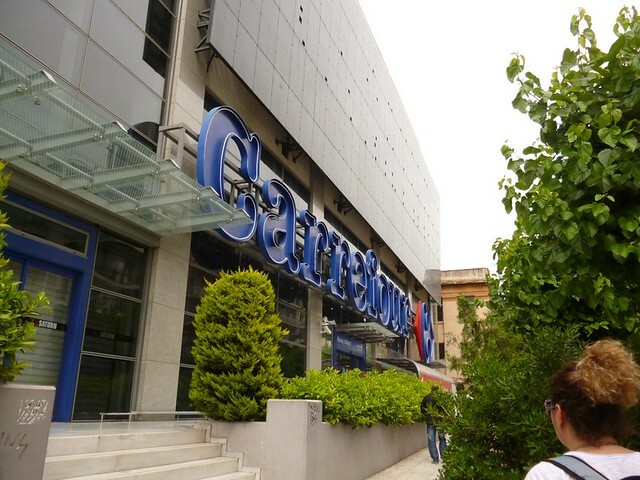 Before that, I stopped at Carrefour (!!!) for some dairy product to prevent my stomach from having severe gastric. I did plan to head out later but my lazy bones decided to stay in with my computer. Let’s hope tomorrow’s more productive!